Lance Corp. Stogner served in the U.S. Marine Corps during the Vietnam War. The presentation, which was facilitated by Montana Sen. Steve Daines and his office, was made by United States Marine Corps Lt. General Frank Libutti. Daines served as master of ceremonies for the well-attended event. April 5 of this year, the date of the commendation, marked the 52nd anniversary of the day when Stogner showed extraordinary heroism and courage while rescuing a fellow Marine. On that date in 1967, the 18-year-old Stogner was serving as part of a machine gun team, carrying ammunition. 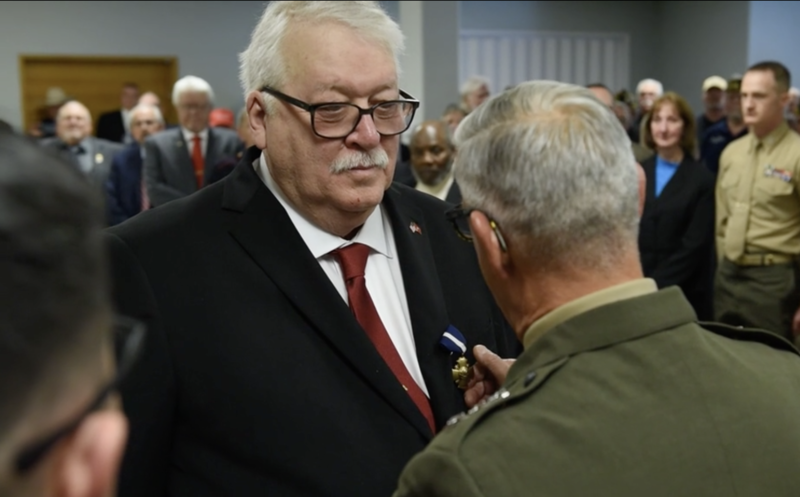 He saved the life of fellow Lance Corporal Elijah "Eli" Fogg, who was being tortured while in the hands of the North Vietnamese Army soldiers — as well as saving the lives of numerous other Marines. 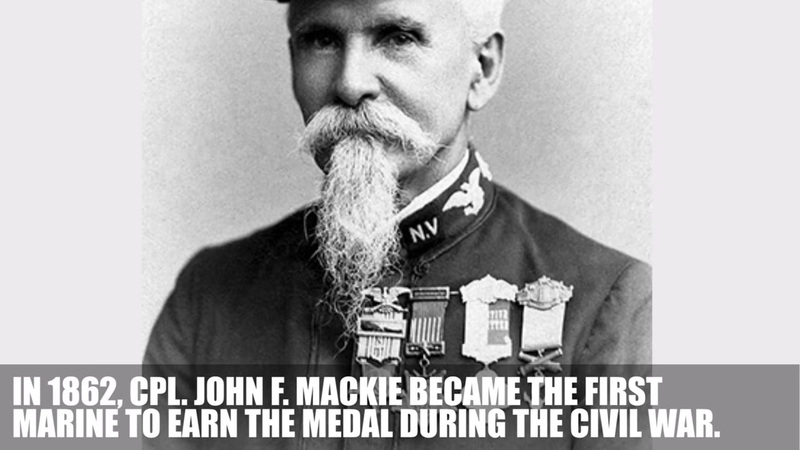 The Navy Cross is the U.S. military's second-highest decoration award after only the Medal of Honor. Lt. General Frank Libutti attended the ceremony to present the Navy Cross Medal to Stogner. He read, "Jim is, no doubt, a Marine's Marine. The kind we read about, the kind we want to be about. Jim's story is a story in a thread in the fabric in our nation's history with a reminder that freedom isn't free. Jim, thank you for the service, thank you for the sacrifice. Congratulations from everybody." On that tragic night of April 5, 1967, Stogner was in Company C (known as Charlie Company) of the First Battalion of the U.S. Marine Corps. He was the "support man" for Fogg, the A (machine) gunner. Capt. Wallace Dixon read a depiction of what transpired. The three units in the company were approaching enemy lines, crossing a dried up rice field. Then came a surprise ambush by hidden North Vietnamese Army soldiers. After Stogner dropped three enemy soldiers, he encountered return fire — which struck and disabled his rifle, which broke his nose. "His platoon had been caught out in the open and they were cut to pieces," Dixon read. As time went on, Stogner used the cover of darkness to push forward toward the enemy. His only usable weapon was a KA-BAR knife. He would dispatch three NVA soldiers before he saw that four others were torturing who was discovered to be a screaming Fogg. Using the knife he dispatched all four while being further wounded. Stogner picked up up Fogg — still alive — and his machine gun, and carried him back to U.S. Marines lines. Twenty-one Marines were killed that night and 30 were wounded, but Stogner's actions undoubtedly saved the lives of many of those who survived the horrific night. "Lance Corporal Stogner's heroism and bravery on the night of April 5, 1967, was never recognized until now, 52 years later. The Navy Cross acknowledged he did perform far and beyond the call of duty for an 18-year-old ammo humper," Dixon read. Following a prepared commendation by Secretary of the Navy Richard V. Spencer, Libutti proudly pinned the Navy Cross medal on Stogner's chest. "What you're going to hear now is that I am filled with patriotism and love for Montana," Libutti said loudly. "There is an old saying in the Marine Corps … "no guts, no glory, no Navy Cross." Jim, you were indeed gutsy, and did bring great glory to our beloved Corps demonstrating extraordinary bravery and courage as reflected in the Navy Cross citation we all heard. You have demonstrated the belief of the Corps: "Leave no Marine behind." "The truth be told … for all who fought in Vietnam, all services, your efforts, my friend, were both noble and honorable," Libutti said. I will drink [raise a toast] for days gone by, good times and bad, and for the memory of special friends who fought the good fight, and paid the ultimate price. God bless them all, God bless our beloved Corps." ©2019 the Lake County Leader (Polson, Mont.). Distributed by Tribune Content Agency, LLC.